To me, the most beautiful thing is skin because it is a portrait of life. I visited the Lucian Freud portrait exhibition in London a few months ago and that made me even more obsessed with it! 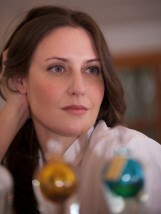 I will be doing an exhibition of skin scents in August at the Edinburgh Fashion Festival.